In the South, slavery had become less and less useful to farmers as tobacco prices began to fall after the American Revolutionary War. But in 1793, Eli Whitney invented the cotton gin. This made Southern grown cotton highly profitable. Cotton also required large numbers of slaves. Most Southerners, however, did not own slaves. But by 1860 cotton and slavery was the strong link in the Southern economy. 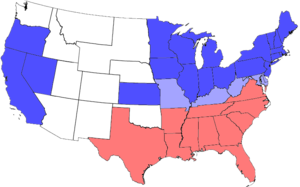 Maryland, Kentucky, and Missouri, which had many areas with much stronger cultural and economic ties to the South than the North, were deeply divided. Missouri had been involved in fighting on the Kansas-Missouri border since 1854 over the issue of slavery. The dispute was aptly named Bleeding Kansas. When the Civil War began on April 12, 1861, the entire state of Missouri was firmly divided between pro-Confederate and pro-Union forces. The governor of Missouri, Claiborne Jackson refused to send volunteers from the state to fight for Abraham Lincoln when he called for troops. Instead, the governor had the state militia muster outside the city to begin training in preparation to join the Confederate forces. He called upon the legislature to authorize a state constitutional convention on secession. A special election approved of the convention, and sent delegates to it. This Missouri Constitutional Convention voted to remain within the Union. ↑ "American Civil War Border States - Brothers at War". Technological Solutions, Inc. Retrieved 27 October 2016. ↑ "Secession". History. A&E Television Networks, LLC. Retrieved 27 October 2016. ↑ 4.0 4.1 "Border States". United States History. u-s-history.com. Retrieved 27 October 2016. ↑ Amy Murrell Taylor. "The Border States". National Park Service, U.S. Department of the Interior. Retrieved 27 October 2016. ↑ 6.0 6.1 6.2 "The Ordeal of the Border States". The Civil War. National Park Service, U.S. Department of the Interior. Retrieved 27 October 2016. ↑ Douglas Harper. "Slavery in Delaware". Slavery in the North. Retrieved 27 October 2016. ↑ 8.0 8.1 8.2 8.3 8.4 Steven Mintz. "The Economics of Slavery". The Gilder Lehrman Institute of American History. Retrieved 27 October 2016. ↑ 10.0 10.1 10.2 10.3 10.4 10.5 "Slavery in the United States - A Brief History". Civil War Trust. Retrieved 27 October 2016. ↑ 12.0 12.1 Mark A. Snell. "Toward Statehood, West Virginia on the Eve of War". Civil War Trust. Retrieved 28 October 2016. ↑ "1861, Lincoln inaugurated". This Day in History. A&E Television Networks, LLC. Retrieved 28 October 2016. ↑ Roy P. Basler; Marion Dolores Pratt; Lloyd A. Dunlap, assistant, eds. (2001). "Collected Works of Abraham Lincoln. Volume 4". University of Michigan Digital Library Production Services. p. 533. Retrieved 28 October 2016. ↑ Tim Talbot. "Kentucky's Neutrality during the Civil War". Kentucky Historical Society. Retrieved 28 October 2016. ↑ 21.0 21.1 "Leonidas Polk, Lieutenant General (CSA)". Civil War Trust. Retrieved 28 October 2016. ↑ 22.0 22.1 22.2 22.3 22.4 "1861 Confederate forces enter Kentucky". This Day in History. A&E Television Networks, LLC. Retrieved 28 October 2016. ↑ "Bleeding Kansas". National Park Service, U.S. Department of the Interior. Retrieved 12 June 2016. ↑ "Nathaniel Lyon (1818 – 1861)". The State Historical Society of Missouri. Retrieved 28 May 2016. ↑ 25.0 25.1 25.2 25.3 "Nathaniel Lyon, Brigadier General, July 14, 1818 – August 10, 1861". Civil War Trust. Retrieved 28 May 2016. This page was last changed on 10 July 2017, at 01:15.